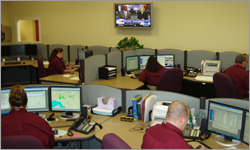 Hart to Heart operates a state-of-the-art 24-Hour Dispatch and Communications Center stationed in our Main Office. Our center features advanced technology that enables us to currently average over 220,000 telephone calls per year. Through this communication hub we process all transportation requests and dispatch all vehicles. Dispatchers play an integral role in our day-to-day operations. Policies and protocols are continuously reviewed with all dispatchers through a continuing education program administered by our Director of Operations & Business Development. Our phone system tracking software, Callwhere, monitors each and every phone call by department and extension and reports the data according to set parameters for easy review. Accordingly, our internal voice recording system records all phone traffic so that at any time, Hart to Heart management can review a call for billing details, accuracy, trip information, compliance, and the customer service efforts of our dispatch staff. Our system provides a dynamic re-deployment of corporate resources to back-fill areas of the community with high ambulance usage. This re-deployment assures the best services provided at the time of request. Each request for service is entered into our cumulative database, which stores each patient's demographic information for future use. Compiled data reduces phone time between caller and dispatcher. Time is of the essence in our business. Our communication center relies on RescueNet software, provided by Zoll Data, for information gathering at the call taking function and for reporting purposes. Late in 2008, the following two applications will further enhance our live, technical abilities as well as improve our vehicle tracking purposes to improve response times. 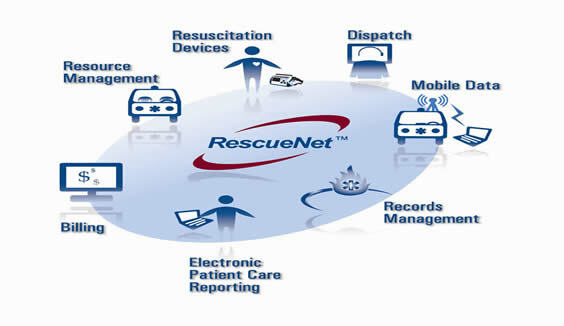 RescueNet TabletPCR is a software application designed to capture and organize all pre-hospital patient, clinical, QA and system information. Medics can quickly and accurately collect patient data in the field, automating data input. Paperless call reporting, consistent and legible reports, and intuitive interfaces are some of the many features of TabletPCR. TabletPCR interfaces with RescueNet Dispatch and RescueNet Billing to provide a high level of efficiency and data sharing between different job functions. RescueNet Nomad is a mobile data software application that provides a real-time communication link between crews, dispatchers and your RescueNet Dispatch database. The electronic exchange of information with RescueNet Nomad eliminates the errors and misunderstandings that are common with voice radio transmissions. Nomad Server is deployed to provide Automatic Vehicle Locator (AVL) data to RescueNet Dispatch to allow for the tracking of vehicle in RescueNet Dispatch.